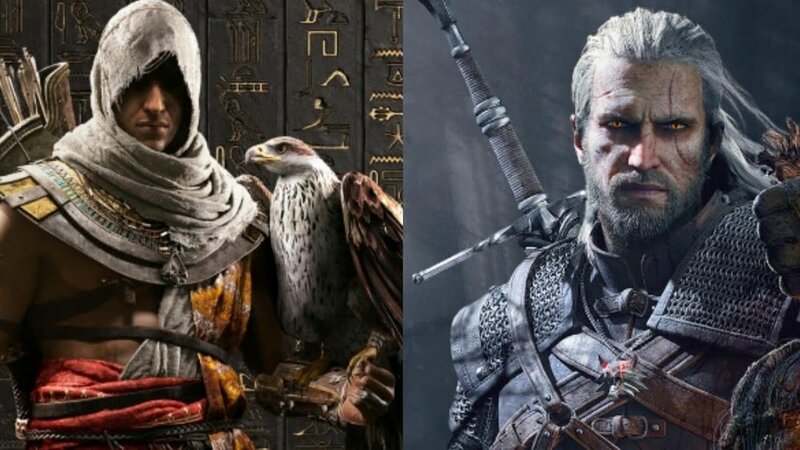 Recently, I came across an article comparing Assassin's Creed Odyssey to Witcher 3. I’ve put over 250 hours into Witcher 3, so when my second favorite game of all time (Bioshock is my G.O.A.T.) is compared to an Assassin's Creed title, it’s something I didn’t think would be possible. Assassin's Creed is a franchise I enjoyed for the first three games and then fell off because of the regurgitated yearly releases. That is until Assassin’s Creed: Origins pulled me back in. Currently, I’ve played Assassin's Creed Odyssey for around 40 hours with 56% completion. In that time I’ve been very impressed with the way Ubisoft has taken what they introduced in Origins and improved on it in every way from the character development, improved combat system/RPG elements, and more comprehensive side quests in the open world environment. The combat system is very similar to the Witcher 3 but not as robust. You’re able to freely spend and reset your ability points, trying different combinations of weapons and attacks. You want flaming dual swords? Check. How about remote control over an arrow for perfect shot placement? Check. Rage mode like God of War? Check. My personal favorite has to be the Spartan Kick. I find myself yelling “THIS IS SPARTA” in my head every time I do it. With this variety and flexibility, your 80th fort you attack is just as fun as the 5th one, driving you to unlock more and more abilities. On top of the abilities of the characters, customization with your weapons is great too. You’re able to get different level of gear off enemies along the rank of common, rare, epic, and legendary. Each piece has different perks so you’re able to match them to your style of play and you can even add additional ones to your gear by engraving. Such enhancements are additional critical damage, stealth bonus, faster ability recharge, breathing under water, etc… And if you have a level one piece of gear that you really like, you can raise it to the max level if you have the necessary crafting materials. Which game does weapons and abilities better? That’s up to your personal preference. I think that most people will like Odyssey more than Witcher 3 in this regard even though the latter has more to choose from. Mostly because you only get one reset on your abilities for the game on the Witcher 3, so you have to choose your points wisely as they will hold a lot more weight as you progress. In many open world games, you could stick to the main quest almost start to finish without feeling that you’re missing out on an epic side mission. Not the case with Odyssey though. Much like Witcher 3, Odyssey is able to pull me in with the many side quests. I found myself with very little regrets going out of my way to a spot with a “?” and spending the time to complete it. Though I still haven’t come across a side quest as memorable as The Bloody Barron in Witcher 3, which is probably an unfair comparison as that side quest is one of the best ever in gaming. Odyssey’s side quests are meaningful though. The fetch quests, as there are many in massive open world game, are even enjoyable. For example, my favorite fetch quest so far is a love triangle where you have to collect items to make a potion that will cause someone to fall in love with an NPC. You can choose different options which effect how it unfolds and who end up with the “happy ending”. It is these kind of details that make your time spent doing extra content satisfying. Even as I was playing the other night I was flagged down by an NPC. I thought “Okay, this should be a 10 minute pit stop for some of that sweet, sweet XP.” Wrong! Two hours later I finished the multiple branching side quest with a thrilling conclusion. Every time I think, I’m going to work on the main story I get distracted by one of the many “?” on the gigantic map. To some this may seem overwhelming (and it is), but it’s an example of how good content all around helps drive people to play your game. My final thoughts on this game and the comparison is that these type of games are best played and enjoyed at your own pace, not thinking about how you’re going to 100% it or beat it fast. I’m the type of gamer that wants to burn through games, but after a few hours in the world of Odyssey I stopped trying to rush to the end and just started to enjoy the ride. So is it as good as Witcher 3? In my opinion, no. Witcher 3 has much deeper RPG mechanics, characters that elicit more emotional attachment, and better side quests among many other qualities that Odyssey cannot match in my play through so far. But the fact that Assassin's Creed Odyssey is even in the conversation with Witcher 3 is an accomplishment to Ubisoft and definitely a journey worth experiencing. Odyssey though is a fun and engaging game that stands on its own and currently, all I want to do is keep playing it. Come continue this conversation with me over in the Discord!